this day or should i say the day before it, is an excuse for an entire town and alot of the rest of the country to party. though with dangriga being the main settlement of the Garunagu people it is a big thing here. Back to Belize with a boat. So I am back to Belize again for another northern winter in the tropics. This time around, I have finally decided to bring a white water kayak with me, and old Riot Disco that I picked up in Arizona. The boat will probably end up living down in Belize for people passing through down here to use. There is only one good river to boat on down in Belize in the dry season (the Moho River) but there may be many more in the wet season (good reason to come back in Sept, October). I get to boat on the Moho allot over the last 5 years and have always wanted to take a hard shell instead off the inflatable’s we usually use. Finally I have got motivated to do it. I checked my baggage restrictions for my flight and I was allowed to bring a pack kayak at 50 lbs with no set restrictions, and luckily due to my booking date I was allowed one piece of check in at 70lbs and my usual carry on. I might just get away with this. I had my Lendal paddles (one ocean and one river) that dismantle into four pieces each, all my guiding equipment, my helmet, guitar and camera gear. I was carrying too much stuff but was going to try it. I got to check in station with help from Nina Lewis, the attendant looked at me in a strange way. “Is that a kayak?” I was asked in a surprisingly calm voice. I put the boat up on the scales and tried to think of possible solutions to problems that may be about to occur. The boat in its boat bag came in at 49lbs, and when they looked for size restrictions and found none the boat was good to go (big sigh of relief from me). my next check in was overweight at 75lbs, and my carryon bag was too big, due to the line behind me I had to take everything, boat and all, out of the way and re pack. It was a great chance to shove new stuff in with the boat and hope they didn't re-weigh it. Paddles, helmet, throw bag some books went inside the kayak, and Guitar stayed behind in the USA with Nina. back at check in they took my bag it weighed 71lbs now and they let it through, the boat, now much heavier, went through without a second glimpse, but my carry on looked to big still, though I was allowed to continue at my own risk. I hugged Nina goodbye and off I went. Once I removed my laptop from my carry on the bag it was more than small enough and on a plane to Belize I successfully was. Arriving in Belize I had missed the last plane to Dangriga, though they told me at the office the kayak wouldn’t have fit anyway, so now I was off to the bus station. The taxi drivers tried to tell me that there were no more buses to Dangriga that night and I should check into a hotel. I don’t think so “I have been here before many times, There IS a Bus!!" I stated. 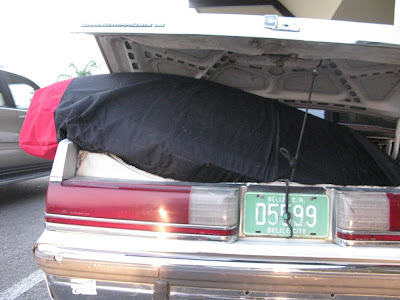 So we loaded the kayak in the trunk of the car and off we went to the station, with the driver asking “was I sure I didn’t want a hotel?” the whole way. On arrival there was a bus due to leave in 30 minutes, I paid the taxi driver after he helped me move my big bag and boat into the terminal and there I waited for my lovely bus ride of two hours to the town of Dangriga where I will live for the next 5 months off and on. It was a simple process of waiting on the bus as it wound through the dark jungle roads heading south until I arrived in the little sleepy town of Dangriga. Not much quaint about this place though it is a great central and affordable location for accessing the rest of the country and outlying countries from. I was met by Andrew who took me to the Staff house that was to be home for the season, I was the first to arrive of all of us who work for Island Expeditions.